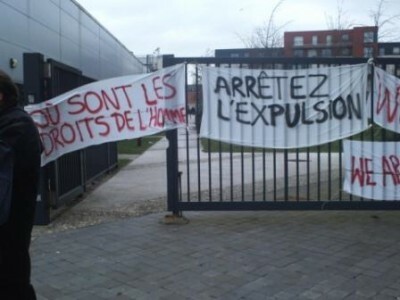 Yesterday at 3pm over thirty people demonstrated at a social housing organisation, the Office Public de l’Habitat de Calais (OPH), to demand that they do not go through with the planned imminent eviction which will make many people in Calais, both with and without papers, homeless in the middle of winter. Some people entered the building to give the director, Gérard CLAIS, a list of demands on camera in order to record his response. The director tried to stop people filming and threatened to take people to court if they publish the footage. Clais confirmed that the derelict university building owned by OPH will be demolished. He refused to take the letter and engage in dialogue on camera. Clearly this ‘public housing office’ fears having its inner workings actually made public. The rest of the demonstrators then entered the foyer and continued to shout their demands to make their voices heard. The whole group was then aggressively pushed out by the police. For over a year people without papers have been living in the derelict university. These half-demolished ruins provide shelter during the summer months, and currently offer some protection from the extreme cold and snow for over 60 people. The OPH is a supposedly a social housing association, this is clearly a farce given their decision to forcefully evict people who do not have anywhere else to live. The only other option for the occupants of the university building, the cold weather shelter, closed on the 14th February after opening from 6.30pm – 8am for just one week. The rest of the year this building, owned by the council, is empty and unused. Many people with and without papers are being harassed and persecuted in Calais with nowhere safe to go. Expulsion from every place people try to sleep is one part of the systematic assault on people’s everyday life; this eviction is the latest in the sustained abuse against migrants and refugees day in and day out. – Do not evict people onto the street, especially when it is winter and freezing outside. – Do not demolish shelters where people without homes live, it is inhumane. – Do not give authorization to police, or instructions to bailiffs, to enter the site at ANY time. The OPH and the council should provide accommodation for all the occupants, no matter what their ‘administrative situation’. Every person should be treated with respect. People are people whether they have papers or not! – The Office Public de l’Habitat de Calais is a social housing organisation and is primarily responsible for providing much of the social housing in Calais. On the 30th January 2012 a court order was obtained by the OPH, giving them the right to evict people from the derelict university building anytime from that date onwards. – The cold weather shelter, known as the BCMO, is run by the council and only opens its doors when it is minus 5 degrees. All throughout the rest of the year this building lies empty. – This is the fifth big squat eviction in seven months, alongside the many evictions and destruction of camps in the jungle, in town, in the parks or under bridges as well as several evictions of the food distribution area – a concrete yard surrounded by barbed wire where people have resorted to sleeping. – Generally, there are very few evictions from buildings during the cold period of November – March due to the French law of trêve hivernale (winter truce), but this is largely ignored by the authorities in Calais when targeting migrants.Trêve Hivernale (winter truce) prohibits evictions during the ‘cold period’ of 1st November – 15th March if the occupant of the building has nowhere else to go. However, it does not apply if the building has been deemed unfit to live in or if the occupant has no legal right to be there. Despite squatting being illegal in France, it has been successfully used as a defence against eviction in some squatting legal cases. – In 2002 the government ordered the closure of Sangatte, the Red Cross centre which provided practical support, such as food and clothing, for people without papers. After the closing of Sangatte, people were driven into the ‘jungles’, sleeping in makeshift shacks under bushes on the outskirts of Calais. In 2009 the main jungle was evicted by force. Since then every place of rest for people without papers has been destroyed. This evidence has been presented to the new Human Rights Commission and is currently the subject of an enquiry.